When people think of cowboys, they usually think of John Wayne. 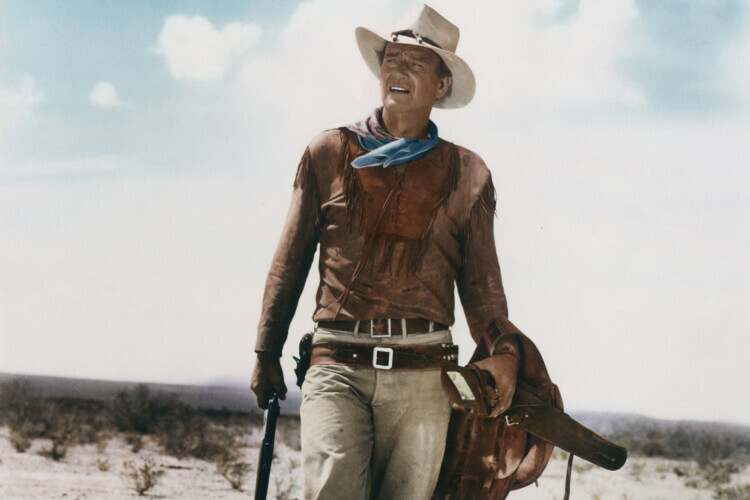 One of the most influential actors of all time, Wayne is the quintessential western film star. While becoming one of the world’s greatest film stars, Wayne also became an American icon. To many, he was the living embodiment of American ideal and values. The Duke described himself best, though, wanting his tombstone to read “ugly, strong and had dignity.” Quite a few would disagree with the ugly part, however. There’s a reason from films like The Searchers and Rio Bravo to cameo appearances on shows like the Beverly Hillbillies, Wayne was everywhere from the ’50s through the ‘70s. However, John Wayne’s legacy lives on far beyond the silver screen. He won numerous civilian awards, changed the movie industry forever, and had a profound effect on cancer patients, the world over. Over his life, Wayne also faced a variety of challenges and controversies. Through it all, he remained strong and, if nothing else, honest. This is the story of John Wayne, The Duke, an American Icon.